The eye’s outermost layer, the cornea is the clear, dome-shaped surface covering the eye. It protects your eye and helps to focus your vision. Most affected by the genetic condition, keratoconus, the cornea receives nutrients from tears and the fluid inside the eye—the aqueous humor, rather than from blood vessels. The macula on the other hand is highly vascularized nerve tissue that is part of the retina at the back of the eye. The cornea is usually considered to have five layers, although a sixth very thin layer has recently been described in older people. Some of the worst symptoms of keratoconus and other corneal problems are related to the passage of light, including night blindness, seeing halos around lights, and sensitivity to sunlight. Nutrition is important for the eye and can help healing in many eye conditions. In the late-19th century, a physiologically complete diet was believed to require only sufficient proteins, carbohydrates, fats, inorganic salts, and water. From 1880-1912, Lunin, Pekelharing, and Hopkins found that animals fed purified mixtures of known food components failed to grow or even lost weight and died, unless the diet was supplemented with small amounts of milk, suggesting that “accessory food factors” are required in trace amounts for normal growth. By this time, Funk suggested that deficiencies of trace dietary factors, which he labeled “vitamines” on the mistaken notion that they were “vital amines [proteins],” were responsible for such diseases as beriberi, scurvy, rickets, and pellagra. Vitamin A deficiency eye disease: Night blindness was recognized by the ancient Egyptians and Greeks, and many authorities from Galen onward advocated liver as a curative. During World War I, Bloch conducted a controlled clinical trial of different diets among malnourished Danish children with night blindness and keratomalacia [softening of the cornea] and concluded that whole milk, butter, and cod-liver oil contain a fat-soluble substance that protects against xerophthalmia [eye conditions]. The epithelium or skin is the cornea’s outermost layer. This skin like layer prevents dust and bacteria from entering the eye. This is the layer which is in contact with the tears and also causes pain when it becomes scratched and is rubbed. As explained in the following quote tears are crucial to eye health. One exercise that can help with tear production is called the blinking exercise. While looking around and asking yourself a question about what you see, blink your eyes for a few minutes. 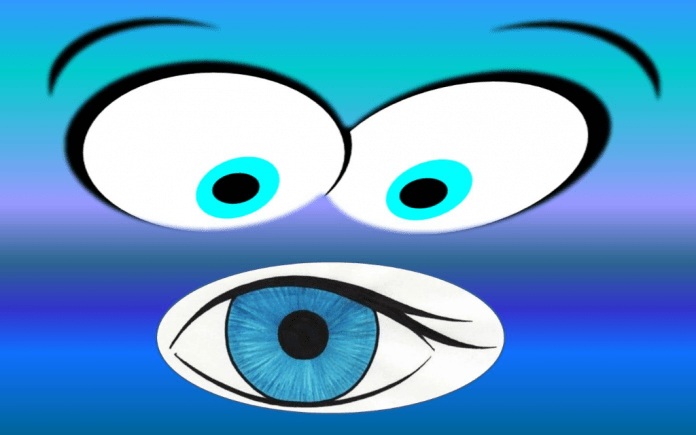 Notice what changes in your vision and the light around you before and after blinking. The next layer of the cornea is a transparent film of tissue called Bowman’s layer, composed of protein fibers called collagen. Scaring of this layer can cause vision loss. If you have looked at recent anti-aging ads you are familiar with the importance of collagen in skin layers. Of course we can’t rub a collagen cream on the eyes, so how can we get good quality collagen and proteins to the eyes. Look at the quality of protein in your diet. Is there enough protein? Is it easy to digest? Most people are familiar with the benefit of eating carrots or sweet potatoes and other orange foods full of vitamin A for eye health but dark leafy greens like spinach and kale also offer antioxidants that protect the collagen layers. Beets, red peppers, and tomatoes are full of lycopene boosting collagen and protecting against sun damage. Blueberries, strawberries, blackberries, and raspberries are also full of collagen supporting nutrients. Other foods that contain Vitamin B2 or Riboflavin and can help with corneal problems and particularly light sensitivity include, beef livers, lamb, milk, natural yogurt, mushrooms, spinach and other leafy greens, almonds and tomatoes, particularly sundried tomatoes. Lycopene (Ly), the most common type of antioxidant in the majority of diet types, provides tolerance to ischemia/reperfusion [blood flow] injury. The thickest layer of the cornea is the stroma made up of water and collagen. The unique shape of the cornea is produced by the arrangement and spacing of the proteins making it strong and elastic while allowing light to pass through it. Again consider the quality of the proteins and water in your diet. Are you drinking enough water? Is the water clean with lots of mineral nutrients? Behind the stroma is a strong easily repaired layer, the Descemet’s membrane. This is a protective barrier against injuries and infections. Vitamin A and carotene, a precursor of vitamin A is important in the transparency of the cornea and is present in large quantities in green leafy vegetables, tomatoes, carrots and some fruits. One study described the distribution of carotenoid intakes and important food sources of carotenoids in the diet of a representative population of older Australians. Carrots and pumpkin were the main contributors to alpha-carotene and beta-carotene equivalent intakes. Orange juice, oranges and papaw were the main contributors to beta-cryptoxanthin intake. Broccoli, green beans and oranges contributed substantially to lutein and zeaxanthin intake. The main contributors to lycopene intake were tomatoes and bolognaise sauce. Vitamin A intake in this population is high relative to the Australian Recommended Dietary Intake. Carotenoid intakes, particularly beta-carotene, make a substantial contribution, particularly from fruit and vegetables. This study provides important information as a basis for examining associations between dietary carotenoid intake and eye disease. The inner most layer of the cornea is the thin endothelium, protecting the cornea from excessive fluid from within the eye. A healthy eye moves fluid containing nutrients from the eye into the cornea and any excess fluid is pumped out of the cornea through the endothelium. This is a delicate layer. In Traditional Chinese Medicine the color yellow is associated with the immune system. Try visualizing the color yellow enveloping the eyes and supporting healing and preventing infections from viruses, bacteria or toxic metals like mercury. These five layers of the cornea as well as the rest of the eye are not only affected by your genetic makeup but by when you eat, how you exercise, what you do, and what you see and visualize. Look, look after your eyes today.